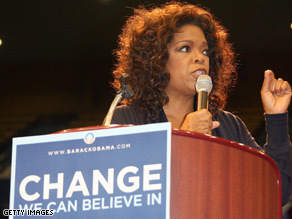 Oprah Winfrey campaigned for Obama in February. (CNN)-The Florida Federation of Republican Women made the decision to boycott the Oprah Winfrey Show Saturday, after the media mogul refused to have Gov. Sarah Palin as a guest on her show until after the election wraps up. "Women in Florida helped build Oprah into the icon she is today," Linda Ivell, President of the FFRW said in a statement. "We are deeply disappointed in Ms. Winfrey's decision to sit out the greatest political moment in the history of women since suffrage." The talk show host denied accusations Friday, that she was even considering the vice presidential nominee as a guest. "At the beginning of this presidential campaign when I decided that I was going to take my first public stance in support of a candidate, I made the decision not to use my show as a plat for any of the candidates," Winfrey wrote in a statement, responding to a story from The Drudge report claiming her staff was "sharply divided" on whether they should book the Alaska Governor. Winfrey agreed Palin would be a "fantastic interview," but wouldn't invite her on until after the November elections. The Florida Federation of Republican Women, the "largest political organization in Florida," celebrating the groups 58 year anniversary is also encouraging members to cancel subscriptions to O Magazine, Ivell said. "We find it to be an abuse of her power -gained on the backs of our patronage of her advertising empire – to use her program to so blatantly support Obama in the face of this historic moment. So, we are tuning out and canceling our subscriptions to O Magazine and encourage other women to do the same," Ms Ivell said. Winfrey came under fire from some of her supporters in December after campaigning with the Democratic nominee in South Carolina. Ivell did not say the Florida Republicans would be tuning out indefinitely, but at least until 'after the election.' Adding, she and her members respect the decision to support Obama, "as every American is entitled to their personal opinion and vote." Point one: Oprah can have whoever she wants on her show. Point two: I agree with Lys–I'd much rather see Mrs. Palin on "Meet the Press". Point three: I don't think Oprah's going to lose any sleep over losing some viewership in Florida–the boycott may backfire and actully drive up her ratings having this so-called "controversy" in the news. Susie, wake up and smell the coffee, since when is Palin about women's rights? Are you watching the same politician the rest of the world is? Who cares if they boycott Oprah. Sarah Palin needs to be interviewed by the Sunday morning talk show hosts. Come on Sarah, you have a mouth on you which just spews insults out at Obama so don't be running scared. People need to know exactly what you stand for !!! Republicans think you have the last word on everything. If you say don't do it the public should not do it. You can't make people follow the beat to your drum. Oprah don't need your money or your support. Republicans and Evangelicals are not the only people in the world even though you think you are. I thought you guys didn't like black people anyway or is love them or hate them when it is beneficial you you. I will be a permanent subscriber of the magazine from now on. Curl up and die you nasty horrible representation of women! BEFORE THE PRIMARY SEASON BEGAN!!!!! Did Oprah have Hillary on? I could care less who Oprah has on no cushy interview, Palin you need to go on the view or meet the press. Oprah didnt have biden on. Palin is very dangerous, she is vindictive (ask her her ex brother inlaw) not very stable(how many schools to get a ba?). While I'm not a Fla. republican, I challenge all NC republican women to join the boycott. Way to go Oprah!!!! Please stick by your guns. Let those old cows stew in their juices if they don't like it!! Who care really. Do you think Florida that because you boycott Oprah we all over the worl will not watching. I think rep. you are all nuts. When / if Oprah has Biden on, she should include Palin – untill she hosts Biden, what's the problem?